Philly.com caught up with Maurice Edu. There’s also a piece speculating that the Union could face Wayne Rooney’s D.C. United in the playoffs. Well played, Union marketing department. 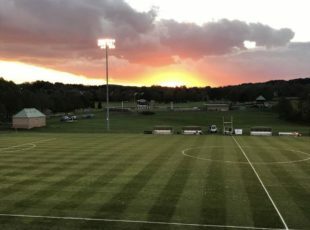 KYW spotlighted Emily Sands of Penn women’s soccer, which are having a killer season (10-1-1 [3-0-1 in the Ivy League]). Misericordia University’s Ashley Edgell, a senior forward, was named the United Soccer Coaches Player of the Week for Division III women’s soccer. Wesley College senior forward Danny Garza and junior defender Matthew Dina were named Atlantic East Conference Men’s Soccer Players of the Week for October 15. Mexico’s offer to Tata Martino would make him the world’s highest-paid national team manager. The Atlanta United’s manager will reportedly make a decision this month. D.C. United’s Chris Odoi-Atsem has been diagnosed with Hodgkin’s lymphoma. The biggest challenges the next manager of the Vancouver Whitecaps will face. So the LA Galaxy Foundation is hosting an event with Zlatan Ibrahimović. Any bets on how soon he makes the night about him? Las Vegas Lights has hired Eric Wynalda as manager and technical director. Nice page to bookmark for the playoffs. USWNT lifts Concacaf Women’s Championship with 2-0 blanking of Canada. Dave Sarachan expects to still be the USMNT coach for November friendlies against England and Italy. “Slow and Low” is not only a Beastie Boys song, but also apparently U.S. Soccer’s modus operandi. Wembley Stadium won’t be sold to Shahid Khan after all. The Jacksonville Jaguars owner withdrew his £600m offer after it seemed more divisive than anticipated. When Stan Kroenke moved to take full control of Arsenal, he was required to buy all outstanding shares in the club. But the fans who owned them aren’t in a rush to hand them over. Usain Bolt turned down a two-year contract with Valletta FC. The Soccer Syndicate and North America’s scouting problem. Soccer is only briefly mentioned, but research shows student-athletes spend triple the amount of time on sports as on academics. Kroenke is no Precourt, but man is he trying…. Eric Wynalda has found a way back in. Quite literally the best news to come out of this country in quite awhile. Congrats to Las Vegas for this. I have to admit that I’ve thought on a number of occasions that if the Union ever decided to part ways with Curtin, Wynalda was the guy I hoped they’d bring in. I’d like to watch the Steel game. Will there be a reliable stream?